« Summer Job, Part II. Of the goats, Vesla’s obliged by the others to be last in the crocodile (and even then she still gets butted). The council are storing bits of pipe up there; the goats occasionally jump on them. The weather has been very changeable lately. and work their way up to the leaves. This is a tree they love, I don’t know what it is. That’s the last time I’ll read your blog during dinner. Such a hobbledehoy you are, flopping a “grass-bermed” on the table while people are eating! I dropped my fork, and by the time I had finished reading the OED entry, my frijoles refritos were cold. I see the goats don’t mind, though. They’re obviously more used to this kind of thing than I am. They would probably eat the OED anyway, without prior consultation. Berming (both noun and verb — as in berming up: Berm me up, Scotty) is quite a common word in architecture, though my spelling checker regards it with suspicion. I just use it to mean an artificial slope of grass or some other naturally-occurring material (but really grass). I advise against reading this blog while you are eating. So it’s not that outlandish. Are there other architectural terms you can think of, off the bat, that are in common use, don’t look technical but that nobody knows? On Radio 4 last night I listened to a program on the American conservative intellectual William Buckley. He was given to flexing his vocabs on TV, in his program Firing Line. Oh, I know a good one: “to charette”. It means to stay up all night drawing, and it comes from the École des Beaux Arts in Paris, in the nineteenth century, where they would take the students’ drawings, to be reviewed elsewhere by the jury, in a charrette, or a horse-drawn cart; and the students, who would be sitting in the cart finishing off their drawings, were said to be en charrette. So, to be en charrette (or, nowadays, more likely on charrette) is still a term used in architecture schools and offices. Oh, hell. I see there’s a Wiki article for charrette, so I guess everyone knows it already. Do you ever listen to Gardener’s Question Time on Radio 4? Somehow I think you’d like it. I sure do, though I know nothing about blooms or veggies. Or Any Questions? The presenter Jonathan Dimbleby is one sharp cookie. I’d love to, but how do I get Radio 4? We have a vegetarian cookery book (in Norwegian) by Jonathan Dimbleby’s wife. I bet MMcM doesn’t have that (but, on reflection, he may). Jonathan Dimbleby’s father, Richard, was a famous BBC tv figure from the 1950s & ’60s. He would always be the BBC commentator for royal weddings. J’s brother David is equally famous at the BBC. One Radio 4 programme I download as a podcast on Fridays is The News Quiz, with Sandy Toksvig. Do you listen to that? It’s very funny, I think you’d like it. I think I’ve heard The News Quiz. Is that the one where cryptic clues from the news are given, and the guests are supposed to recognize and improvise wittily on them? On charette is good, like people finishing an IT project just before the deadline. What’s a triglyph? Sounds Mayan. Just a light wipeover with a mild bleaching agent and Topsy would have fitted right in – great shot. Who butts Vesla if she’s at the back? Topsy. It’s the herding instinct, she likes them all to hurry along. We’re going to have to start calling you Ungrumbly Stu. Ooh, a new nickname! My preference would be for Paagal Stu, because it sounds like a dish and describes me perfectly. (Googles paagal… ‘crazy’ in Hindi). Paagal Stu it is, then. I think it’s terribly sad that little Vesla even gets butted by even littler Topsy. I hope Vesla comes back next time as Pan, but with Loki’s attitude and a notebook of scores to settle. Vesla’s as tough as old boots, as you will see in Part 2. In English, at any rate, the number of Rs and Ts often varies. I have nothing witty to say, but they are just beautiful. Beautiful. Not even silly with dandelions – just even MORE decorative. You’re right, of course. Thanks. They’re all friendly animals with very different personalities. I used to work with “bunds” which seem to be much the same as your berms. But they were mainly inhabited by conies, not goats. I suppose ’embankment’ would be the generally-accepted name for berm. I’ve never heard ‘bund’ (to mean this). In what context, dearie? Charrette was the name of a wonderful architect’s supply shop in Harvard Square in the ’70s. They expanded around the States in the booming ’90s, but have since closed their storefronts and whatever was left was bought out by some printing company. I do not. Is it strictly vegetarian, or is fish allowed? And is it by Josceline Dimbleby? She’s David’s wife. Or maybe ex. As always, you’re right. It’s by Josceline and it’s called in the original 1994 version ‘The Almost Vegetarian Cookbook’ . In Norwegian it’s Så godt som grønt: med fugl, fisk og skalldyr — so, actually, not very vegetarian at all, then (first line: Jeg tror jeg aldri kommer til å bli helt vegetarianer.) I’m sure you’re right about her being David’s wife, or ex-, too. All Dimblebys look alike to me. Paagal Stu claims he is a dish? Well, I am one too. Just look at the header pics on my blog. I remember they started there and I was sorry Charrette went out of business. My architecture school (Columbia) had a little Charrette-owned shop for supplies, in 1977. The larger NYC one on E 33rd (?) St. was a great resource, though overpriced. Which channel is it that carries “I’m sorry, I Haven’t a Clue”? I keep forgetting to check when it’s on, since I always have Radio 3 running in the background. Our bunds surrounded large hydrocarbon storage tanks. Best story: one day the boss decided that we’d better test to ensure that the bunds really would contain the liquid if there were a catatrophic leak. So lots of precautions were applied and then fire hoses were used to flood the area. Alas, the water surged through the rabbit holes in the bund, pursuing the startled rabbits. Tee-hee, we thought. It always used to be Radio 4, and apparently it will be back on Monday at 18.30 (BST). But without Humph, I’m not sure I could bring myself to listen to it. Where’d you get these pictures from dearie? 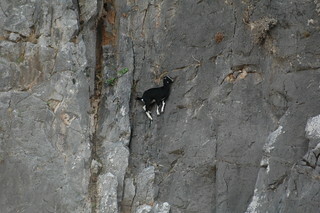 You could start your own suicide goat blog. Ha, ha. Was that in Australia, by any chance (rabbits)? That giant penal colony to my west wasn’t the only place to have a real problem with rabbits. Before the illegal introduction of Rabbit Hemorrhagic Virus here, it got so bad in places that there was TV footage of rabbits eating rabbits. Sadly the virus was not well-managed and the population is on the way back u. The piccie was from 2Blowhards, as I failed to communicate. The bund was in N Yorkshire.